Purchased originally at the Chicago 1991 ANA 100th Anniversary Heritage auction, this key coin has been housed in my Capital Plastic cent case since that time, along with my high grade (XF-BU) Indian Cents. If you are seriously looking to own this wonderful key coin contact me at headstailscoins@aol.com for further information. Buy or trade for silver/gold. 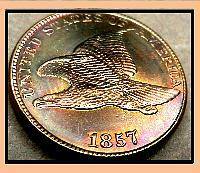 do you have the 1856 flying eagle? Buying flying eagle cents online is now easier than ever. eBay has not only the largest selection, but you can view seller ratings and read feedback to help you pick the best sellers to deal with. Just click on the Flying Eagle coin below to start browsing the great selection!